TruGlo's fiber-optic front sight adjusts for elevation; rear sight adjusts for windage & elevation. 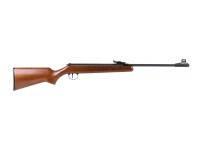 Choose the attractive and affordable Diana Model 240 Classic for a fun day of plinking. This breakbarrel features an adjustable trigger and TRUGLO fiber optic sights to get you on target fast. Things I liked: Fits my 11 year old granddaughter like a glove, she really likes the Diana's firing cycle, one quick snap and very little vibration. Nice finish on the metal work and stock, trigger perfect right out of the box. Things I would have changed: There is nothing I would change at the moment. 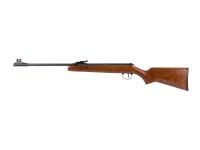 What others should know: This is a very nice rifle for a young person or for an adult of small stature and yet a full size adult would have no difficulty shouldering it. Kills soda cans at 20 yards with ease, have yet to try for accuracy but with it's mild disposition I expect it to perform well. What others should know: This is a lightweight lower power gun, for the money it is a quality piece. Things I liked: The 240 Classes is very accurate, easy to handle, and absolutely reliable. I'm using it primarily to train my grandson and it is perfect! Things I would have changed: Basically nothing. Some texturing on the stock grip and forearm would make for better handling. 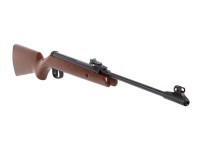 What others should know: You will be pleased with this rifle. What is the length of pull? I really dont like the fiber optic sites on the Diana 240. Are there standard blade iron sites , front and rear, that Could be installed on the 240? Does not have to be Diana product. 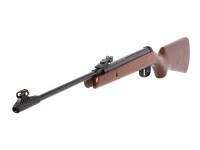 Will this rifle have barrel droop like most all other Diana's? I agree with you that most Dianas are droopy. However, I just got a 240 and there is very little to no droop. I also recently just got a new Model 34 that has minimal droop. A lot of break barrels have barrel droop not just Diana. Ballistol Lube, Aerosol Spray, 6 oz. Otis Flex Cleaning Kit, .177 & .22 Cal.